Last Sunday we drove down to New York City for the day. We don’t get down there nearly enough, and I don’t think that we’d been in Manhattan around the holidays since way back when the kids were little and we went for the Thanksgiving parade. We didn’t have a particular agenda like a show to watch or anything. Bascially, we planned to act like tourists, walking around, checking out the markets that the girls like to explore, eating yummy food, and admiring the Christmas decor. At first we’d planned to take the train, but then Cute W decided he liked the flexibility of driving. I am just happy that I don’t have to do any driving, so: sounded good to me. We parked at a garage uptown, then headed downtown. We were very lucky to have excellent weather: upper forties and low fifties, so perfectly comfortable for us Upstate New Yorkers to walk around. Our plan was to start with lunch, then gradually spend the afternoon and early evening wandering uptown. 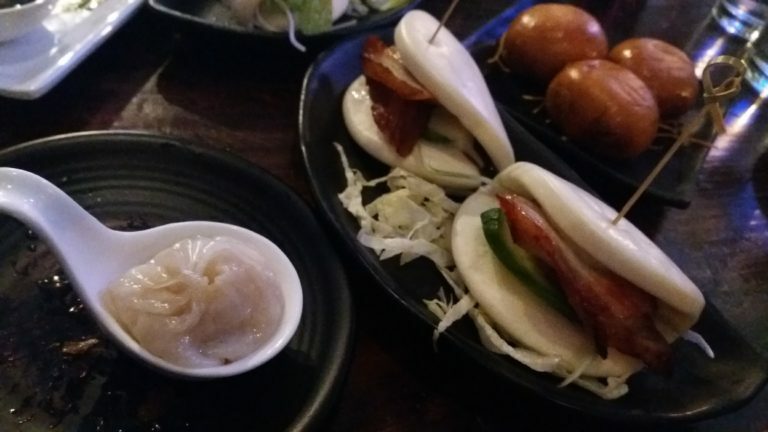 We went to Niu Noodle for some dim sum. When I first suggested dim sum I’d sort of envisioned the classic Chinatown experience — a huge dining room with servers pushing carts from table to table– but this was closer to our planned walk, and they were just opening as we arrived in town. It was all tasty: the sizzling dumplings and soup dumplings were our favorites. From there, we headed to Union Square, where they have a super fun holiday market. Think upscale flea market, but upscale enough that there are tons of items that you wish you owned yourself or could gift to someone else. It makes you wish that you could win one of those shopping sprees where you throw everything you can carry into a big cart. Except that you couldn’t actually maneuver a big cart because it’s super-busy. 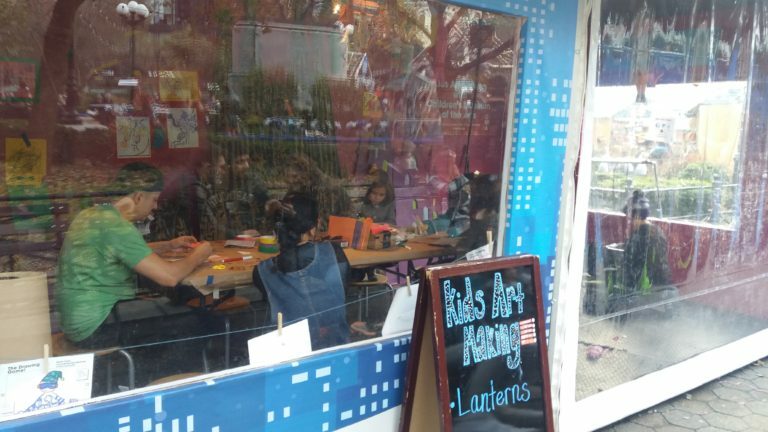 They were also passing out free hot cider, and there was a kids’ area where kids could make a craft in a sheltered space. That was fun for walking around. We continued wandering uptown, and we stopped at ABC Carpet & Home, which is super-fun to walk around in, even if you don’t have thousands upon thousands of dollars to spend on a crystal to put on your coffee table. 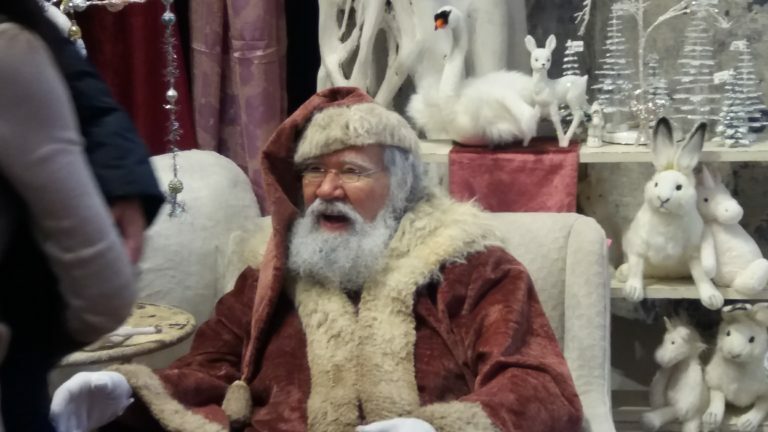 As we headed in we noticed a line, and it turns out that it was families waiting for a photo opportunity with one of the most picturesque old timey Santa Clauses I’ve seen, ever. The girls thought he was slightly too shabby chic for their tastes, but I thought he looked awesome, and judging by the crowd, an abundance of both fashionable Manhattanites and random tourists agree with me. We continued uptown, stopping along the way. We went into Macy’s, basically just to check out the decor, and it was beautifully decorated but too jammed with shoppers for us to last long. At about this point we needed to fortify ourselves, so we headed over to Cafe Bari, where we treated ourselves to some sweets. 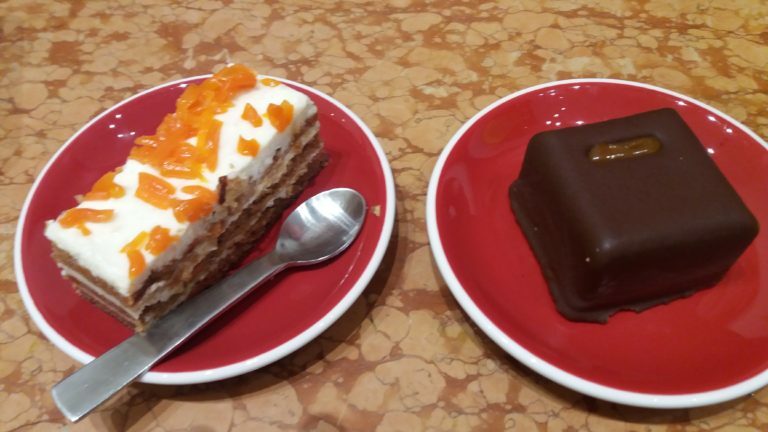 We ordered a Carrot Cake and a Caramelo, which you see below, as well as a Chocolate Crunch, which they were still cutting when I took this picture, and asking everyone to wait for it without digging into the first two was just asking too much. Each item was received with a great deal of enthusiasm by at least one member of the family, so it was good for sharing. Personally, I cannot imagine a scenario in which I’d waste my time and belly space on carrot cake when there are chocolate options available, but I appreciate that other members of my family have different tastes, especially when it means more chocolate for me. These were super-delicious, and we can be pretty darn snobby about our desserts, because we’re pretty good at baking at home. 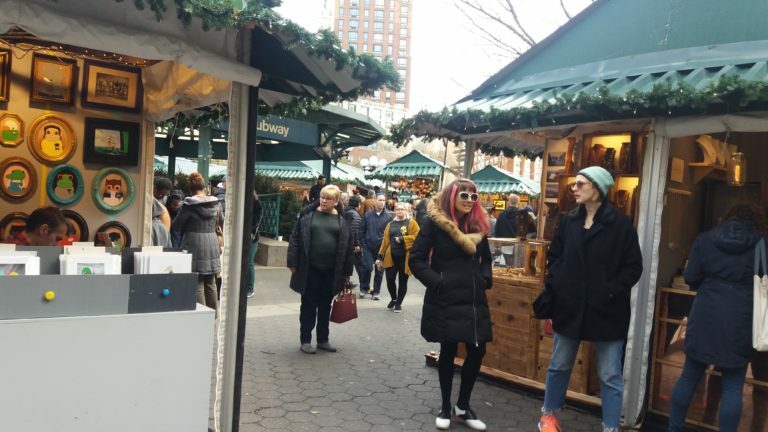 Then we hit Bryant Park, which has parlayed its delightful urban oasis into a holiday destination, with tons of shops and an ice rink. We spent some more time wandering here, shopping a bit and watching the skaters. 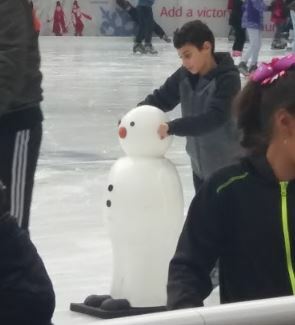 Admission to this ice skating rink is free, plus we loved the little snowman & penguin pushers the newbie skaters were using. They’ve got other family-friendly activities there, too. I had to go to the bathroom, but I also love any excuse to go into the beautiful New York Public Library, a place I’ve spent many, many hours back in my graduate school days. Everyone came in to check out the tree and then to pay our respects to the original Winnie the Pooh and friends. I really love how they’re on display smack dab in the middle of your basic children’s library room, with kids roaming all over the place. Have I mentioned that I love this library? Anyway. We headed onward and upward to Rockefeller Center, which was c-r-a-z-y. Like, unpleasantly crazy. What were we thinking, Sunday afternoon at Rockefeller Center? We stopped here and there to window shop or check out holiday windows, but the actual time we spent at Rockefeller Center was pretty short, because it was just too overwhelming. Really, most of our time was spent in walking around Anthropologie, which the girls and I love, while Cute W bonded with another out-of-town visitor waiting for his wife outside the store. We had originally intended to continue up Fifth Avenue and into Central Park for a visit to Wollman Rink, but by this time everyone was feeling pretty worn out as well as hungry. After a bit of Yelp consultation, we decided to head to dinner at An’nam for some Asian fusion. I didn’t take any pictures at this one–I was getting tuckered out!–but the food was great. We held back and boxed up leftovers for lunch (really, I think it turned out to be breakfast), so we could pick up some ice cream on our way to the parking garage. It was an excellent day. If I had all of childhood to do over again, I probably would’ve taken the girls when they were younger and just played hooky midweek in order to take advantage of the holiday splendor, but for 2018, our two teenage girls enjoyed cruising around, roaming the shops, and eating yummy foods just like we do on our more elaborate vacations. 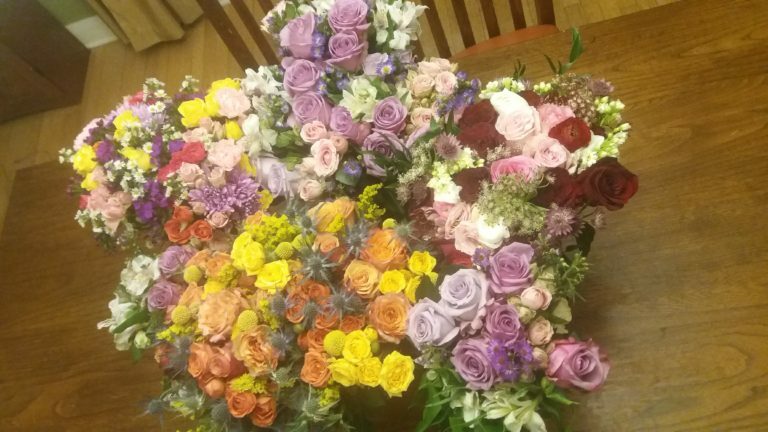 And any day that ends with an armload of flowers is pretty damn good. Excellent adventure for a Sunday! I love to read about your familes’ escapades. Bryant Park has the nicest art deco public bathrooms in the entire city. Check it out next time you’re down that way – I guarantee you’ll be impressed! @Silvia, I’ll have to check it out next time — lines were hugely long when I went. @Aliza, you KNOW it’s not perfect. . . I just don’t like to spew bad karma all over the internet! @Aunt Sue, would you believe that some of them are STILL alive and looking good? And we have one lovely dried bouquet. . . .